People who play video games prefer to play as good guys. That’s what game designer Stéphane Beauverger’s research has shown, with some three quarters of players who are faced with in-game moral choices choosing to walk the path of angels. He wants to play with that. He wants to tempt players to play evil. He’ll get his shot in his studio Dontnod’s next game, the 2017 console and PC action role-playing game Vampyr. From the people who brought us last year’s hit episodic supernatural high school drama, Life Is Strange, comes this adventure involving reluctant doctor-turned-blood-drinker Jonathan Reid fighting vampire hunters and battling a greater monster threat in a quarantined part of London in 1918. The twist in the game and the mechanism for toying with players’ moral compass is the fact that the game will contain some 50 or so civilian characters who will go about their daily lives throughout the region, all of whom you can kill. There are no unnamed characters in the game, Beauverger said when he demoed the game for us at E3 earlier this month. The civilians all have names, friends, families and daily routines. Kill one, and you’ll see the ramifications on the others. It’s a clockwork system, but one Beauverger realizes players might be too nice to mess with. How to tempt them? “You will never be forced to kill anyone, but the game invites you to do so,” Beauverger recently told Kotaku in an interview, “because you will get a rewarding amount of experience points when you kill someone.” Killing innocent civilians in the game will reward players with more experience points than they’ll attain from killing the game’s standard bad guys. Those points will allow them to become more powerful more swiftly. Many game designers have intertwined the moral opportunities in their games with rewards systems, though the most prominent examples tend to balance the consequences of making either choice. Ruthlessly “harvesting” the “little sisters” in 2007's BioShock may have netted twice the immediate reward as rescuing them did, but other rewards for the rescue option made both options similarly viable. The Paragon/Renegade morality system of the Mass Effect games gave players distinct but balanced options, offering the greatest rewards to people who went far in either direction. 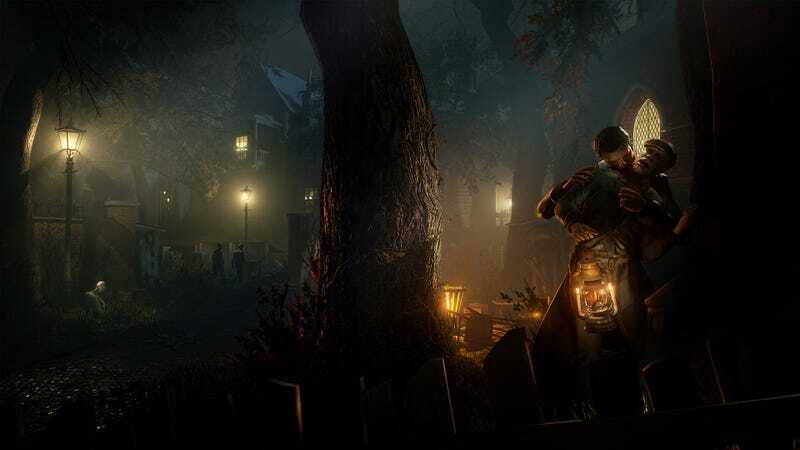 In Vampyr, much of the gameplay advantage will come from killing civilians. The reason not to do so will simply be because it might feel wrong. That’s the idea behind giving each of the game’s civilians a backstory. You might feel bad about the families you’re hurting or, say, the child you’re leaving without a dad. As players explore early 20th century London and engage in the game’s central conflict of reluctant vampire vs. vampire hunters and monsters, they’ll be able to learn more about the civilians around them. Reid is a former doctor, and the idea is that he doesn’t want to give in to his thirst for blood, but the reward for doing so will just be so tempting. Kill too many civilians, though, and the districts of London will plunge into chaos. The developers want you to tempt you to be the bad guy, but they don’t really want you to go too far. The studio behind Vampyr has made some interesting games. Dontnod’s Remember Me explored the commodification of memory in a futuristic society. Its Life Is Strange hooked people with compelling, supernatural high school drama. At a glance, Vampyr appears more brutish and more generically just another violent third-person action game. The idea that every life in the game has a purpose, though, stands out. It has the best chance of making this game feel special, too, by tweaking players’ sense of right and wrong and encouraging them to act, in the game, against their kindest instincts.